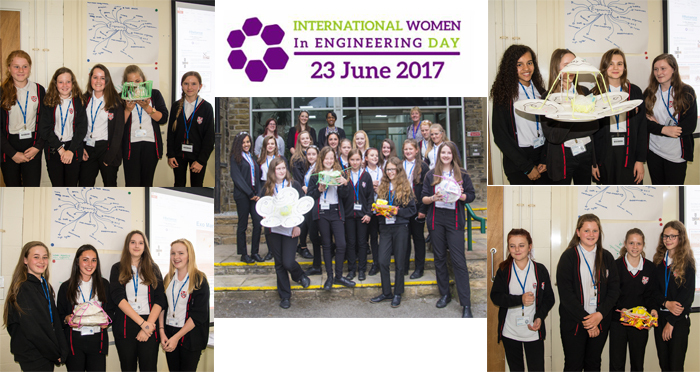 Reliance celebrated International Women in Engineering Day by hosting an event for female students and teachers from local Honley High School, providing them with an insight into engineering and the different career opportunities available. Seventeen Year 8 girls attended the event. The day started with an introduction to engineering, before a number of Reliance’s female employees explained their roles within the business and their respective career paths to get there. The girls were then taken on a factory tour to see the manufacturing operation first hand, and witness some of the latest technology. The day concluded with the girls being set an engineering challenge in small groups. From the same set of core materials provided, each group had to build a ‘lander’ vessel to protect an egg being dropped from a 4 m height. The resulting solutions were all very different in design, and all successfully withstood the drop from the mezzanine balcony, with their eggs remaining intact. The students attending agreed it had been an interesting day, with many saying Reliance was completely different to the perceptions they had of an engineering company. A couple of girls admitted it had made them seriously think about a career in engineering. Another explained she wanted to come along to find out more because her sister was one of this year’s successful applicants to the Apprenticeship Scheme, due to start in August. Reliance believes it is important to get involved with events such as INWED, and actively encourages its employees to organise events related to their work. It’s particularly keen on those designed to inspire the next generation, and as an organisation continually striving to attract the best candidates to their long standing Engineering Apprenticeship Scheme, developing relationships with local schools and colleges is important.